Good morning everyone! Today is our last day in Vienna and I am truly devastated. I have absolutely LOVED Vienna and everything it has to offer. This morning began with a tour of the Vienna State Opera House. The State Opera, as the locals call it, was built in the years 1861 to 1869 in Neo-Renaissance style by Czech architect, Josef Hlavka based on plans made by August Sicard von Sicardsburg, a Viennese architect. On May 25, 1869, the opera house solemnly opened with Mozart’s Don Giovanni in the presence of Emperor Franz Joseph and Empress Elisabeth. In the last year of World War II, the Vienna State Opera was nearly destroyed during an allied bombing raid intended for another target. Only the front section and the main stairways remained intact. The stage and the auditorium, however, were completely destroyed. They have since been restored to ultimate grandeur complete with a chandelier weighing over two tons. The Opera house has a ten month season beginning each year on September 6th. The performances are cyclic and the actors and orchestra have over 60 operas in cycle. This is called a repertoire performance. The tickets for the performance on September 6th are much more expensive than most performances at the Opera House but are still relatively affordable – especially compared to the price of a Broadway show. However, every February a debutante ball is hosted and tickets cost an exorbitant amount of money especially when families wish to purchase box seats. These boxes can go for 21,000 Euro each and sell out almost a year in advance. After our visit at the Opera House we were given about an hour and a half to grab brunch or go souvenir shopping. We then met back in our groups outside of the Opera House, boarded the buses and headed off to Schönbrunn Palace. 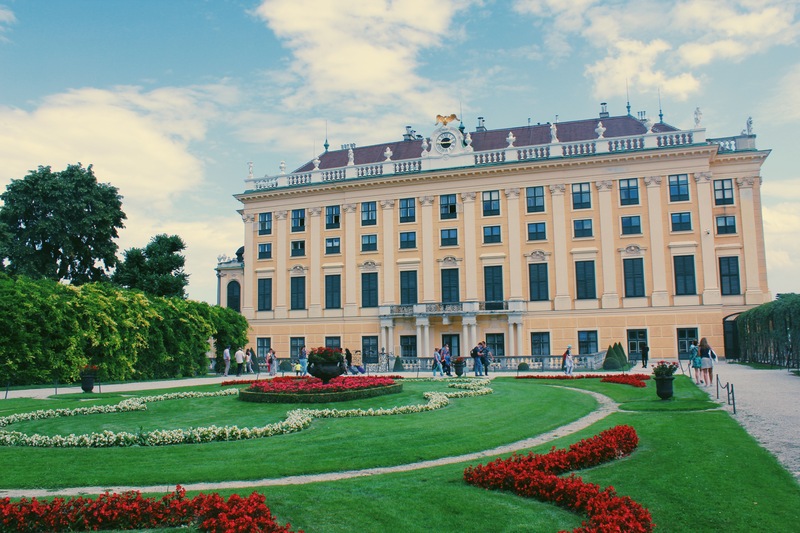 The palace was the summer castle of the Habsburg Family and home to all the ruling monarchs of Austria. Schönbrunn was the favorite residence of Emperor Franz Josef, who was born and died in the palace. The palace is home to one of the finest preserved French style gardens of the Baroque period complete with marble statues, gorgeous greenery, shrubbery, flowers, and fountains. After our guided tour of the first floor of the palace, we had another hour or two of down time to relax, wander about the gardens, or buy some much needed gelato at the shop just outside of the palace walls. I bet you can guess what I did. Next, we headed back to the hotel to change and get ready for dinner. Our dinner tonight was at Heuriger Mayer am Pfarrplatz. The first thing I said to my best friends when we walked into the outside patio area where we ate dinner was “Holy poop, this would be the most adorable place for a wedding reception.” The view was phenomenal, the greenery was beautiful, the wooden awnings were gorgeous, and when it began to get dark the Christmas lights which wrapped around the awnings and the street lamps at the end of each table lit up in a glowing gold that made the chill of night seem warm and inviting. The dinner we had at Heuriger Mayer am Pfarrplatz was probably my favorite dinner thus far. It was a buffet complete with salads, chicken, potatoes, varied vegetable dishes, bread, and, the best part, unlimited water!! My friends and I were in our glory. Delicious food, light conversation, and spectacular ambience made this week’s worth of not-so-great dinners totally worth it… hopefully the awesome dinner streak keeps going as we travel to Budapest tomorrow!